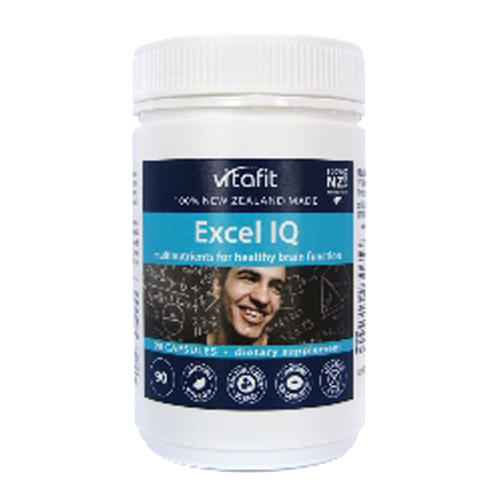 Excel IQ contains a comprehensive range of herbs, vitamins, amino acids and beneficial nutrients that are vital for the normal functioning of the brain and nervous system. 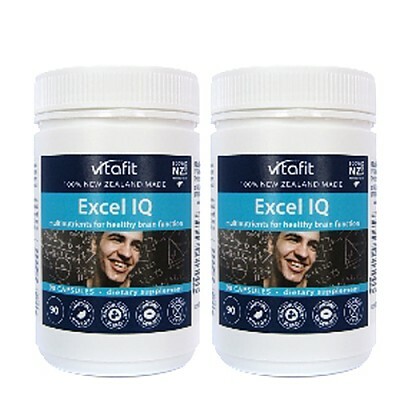 These potent ingredients help support cognitive function including mental clarity and concentration. Excel IQ에는 뇌와 신경계의 정상적인 기능에 필수적인 허브, 비타민, 아미노산 및 유익한 영양소가 포함되어 있습니다. 이 유력한 성분은 정신 명확성 및 집중을 포함하여인지 기능을 지원합니다. At the time of manufacture each 5 capsules contained: Gingko Biloba 2000mg, Guarana 720mg, Gotu Kola 600mg, RNA 600mg, Panax Ginseng 500mg, L-Glutamine 400mg, L-Taurine 200mg, Ascorbic Acid (C) 200mg, D-Alpha Tocopherol (E) 160mg, Choline Bitartrate 150mg, L-Tyrosine 125mg, L-Phenylalanine 75mg, Inositol 60mg, Calcium Pantothenate (B5) 40mg, Nicotinic Acid (B3) 30mg, Thiamine (B1) 20mg, Pyridoxine (B6) 20mg, Phosphatidyl Serine 16mg, Riboflavin (B2) 10mg, Folic Acid 200mcg, Cyanocobalamin (B12) 50mcg. This product contains encapsulating aids. Herbal extracts used. 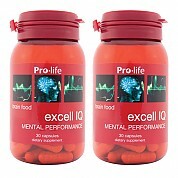 Adults: Take 2-5 capsules daily, 20 minutes before food or well after food, or as professionally recommended. Do not exceed the recommended dose. Not to be taken by pregnant or lactating women, and those using MAO-Inhibiting medication (anti-depressant). 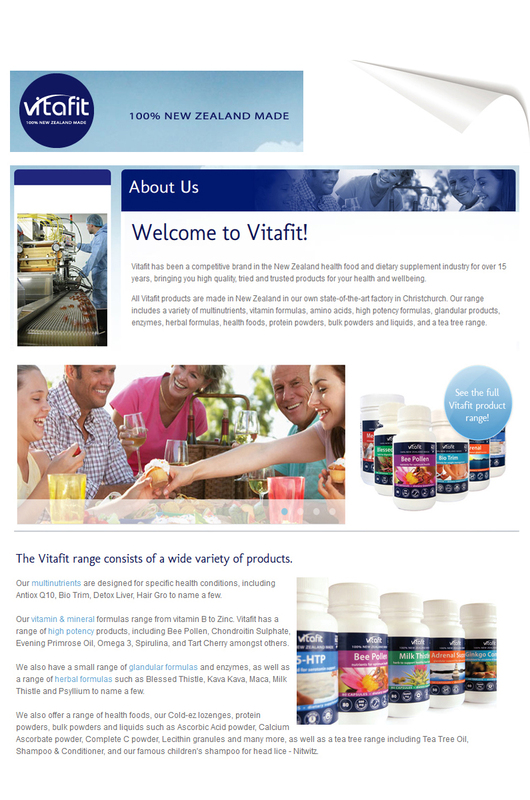 Seek professional health advice if suffering from a medical condition or taking medication before supplementing. Ginkgo Biloba 2000mg, Guarana 720mg, Gotu Kola 600mg, RNA 600mg, Panax Ginseng 500mg, L-Glutamine 400mg, L-Taurine 200mg, Ascorbic Acid (C) 200mg, D-Alpha Tocopherol (E) 160mg, Choline Bitartrate 150mg, L-Tyrosine 125mg, L-Phenylalanine 75mg, Inositol 60mg, Calcium Pantothenate (B5) 40mg, Nicotinic Acid (B3) 30mg, Thiamine (B1) 20mg, Pyridoxine (B6) 20mg, Phosphatidyl Serine 16mg, Riboflavin (B2) 10mg, Folic Acid 200mcg, Cyanocobalamin (B12) 50mcg. This product contains encapsulating aids. Herbal extracts used. - 임산부, 수유중이신분는 섭취하지 마십시오. 보내주신 캔디가 너무 맛있어요. 조만간 캔디 사러 다시 올 듯 합니다.